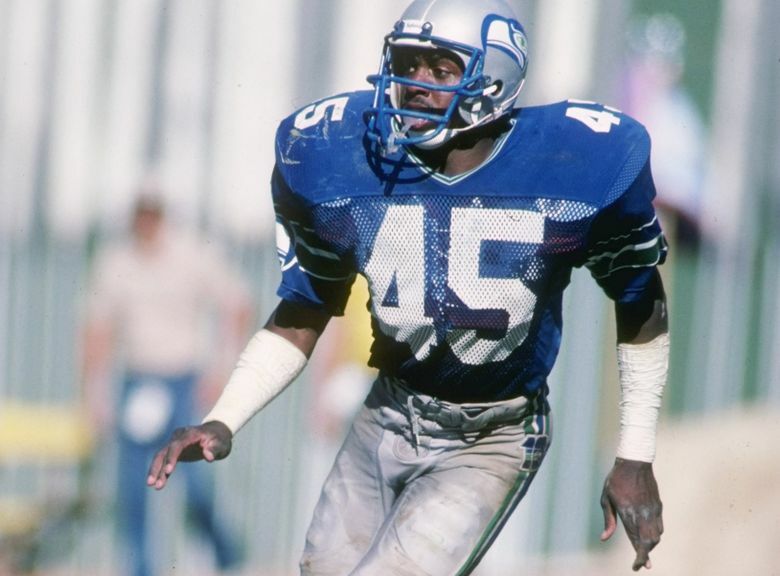 Former Seahawk Kenny Easley said Wednesday a dream the night before foreshadowed his election to the Pro Football Hall of Fame last February. Kenny Easley can reveal now that by the time the knock on his door came last February letting him know that he had been elected into the Pro Football Hall of Fame he felt like he’d already lived through the moment. Well, maybe not that exact moment, but something close enough to it. In a conference call Wednesday to talk to reporters with the Aug. 5 induction ceremony in Canton, Ohio growing ever closer, Easley recalled the night before the vote was taken. Easley was in Houston, the site of the Super Bowl, with his family and said he had a “vivid” dream in which he saw his jersey number 45 “up in the rafters” of CenturyLink Field along with those of other Seahawks who have been inducted into the Hall of Fame — Steve Largent, Walter Jones and Cortez Kennedy. Those three are the only other players besides Easley to be inducted into the Hall of Fame who spent their entire careers with the Seahawks, the other three eventually also having their numbers retired (Easley’s has yet to be retired). When the knock on the door came from Hall of Fame president David Baker that Easley had indeed been elected the dream came back into his mind. Not that it wasn’t a long time coming. Easley played safety for the Seahawks from 1981-87, a time in which the team experienced its first significant success, advancing to the AFC Conference title game following the 1983 season and going 12-4 in 1984, a season in which Easley was named as the Associated Press NFL Defensive Player of the Year. At that point he seemed well on his way to the kind of career that would indeed make a Hall of Fame election a formality someday. But then his career ended seemingly overnight and enveloped in controversy. Easley was Seattle’s Players’ Rep during the 1987 season, which was interrupted by a strike — which some felt particularly helped split apart a Seahawks’ team that entered the year as a Super Bowl favorite and instead finished 9-6 and out of the playoffs after the wild card round. Easley was among those who figured his involvement in the strike then helped lead to his trade the following April to Arizona for quarterback Kelly Stouffer. But Easley never played for Arizona, or for any team ever again, after it was discovered he had irreversible kidney damage that Easley alleged was due to an overdoes of painkillers given by Seahawks’ trainers to deal with an ankle injury. He later sued the team, settling out of the court. Just like that his football career was done at the age of 29, and in part due to having played just 89 games over seven seasons, he wasn’t given serious consideration for the Hall of Fame when he first became eligible. Not that he cared much at that point. He returned to his native Virginia following retirement and worked in real estate and owned a Cadillac dealership and raised his family — he has three children. The family home, he said, contained no football or Seahawks memorabilia with the hard feelings of the end of his career lingering — Easley said he intentionally had no contact with the team for roughly 15 years. A thaw came in 2002 when Easley received a call from Gary Wright, the team’s longtime publicity director, who told him that owner Paul Allen had a simple request — there would be no additional players added to the team’s Ring of Honor until Easley’s name was included (at the time there were six — Largent, Jim Zorn, Dave Brown, announcer Pete Gross, Curt Warner and Jacob Green). That the team now had different ownership, Easley said, made it easier to reconnect — those he had issues with were now gone. But he also realized he wanted to share his football accomplishments with his children, who were now older and able to understand it better. Easley agreed to be inducted into the Ring of Honor in 2002 and has had cordial relations with the team since. Easley’s ties to the organization have been further strengthened in recent years due to his relationship with current strong safety Kam Chancellor, who like Easley grew up in Virginia and briefly dated Easley’s daughter, Gabrielle (Easley had moved to Norfolk where Chancellor grew up and Chancellor and Easley’s daughter attended Maury High School together). But while he grew to terms with his football career, Easley wasn’t sure the Hall of Fame was in the offing until a few years ago when he was told there was a move afoot to have him be nominated by the Seniors Committee. That nomination finally came this year and Easley, well, easily received the 80 percent of the vote needed to get elected. Easley became just the eighth pure safety to be inducted into the Hall of Fame and first whose career began after 1970. Easley said Wednesday that while “I don’t know why” more safeties hasn’t gotten in, he speculated that he thinks safeties are simply easy sometimes to overlook on the field. They don’t get a lot of sacks, the way linemen and linebackers do, and they don’t spend a lot of time in man coverage to make a lot of highlight-reel plays on the ball, the way corners do, he said. Some, though, think Easley’s induction could help break that trend (John Lynch was a finalist this year and could get in soon). And while Easley didn’t say it, he knows well that someday he could be joined in Canton by one or two of the team’s current safeties.